The fickleness of F1 watchers amuses me sometimes. Every year it seems that Ferrari are touted as the team to beat - until the first race where things do not go their way. Then McLaren are seized upon as the real contenders - again, until they have a bad race. But when a team has two poor races in a row, they are thrown out as no-hopers and a new favorite installed. It is clearly ridiculous. For a rational and realistic assessment of Ferrari's chances this year, read what Aldo Costa, their technical director, has to say in an Autosport article today. It looks as though he will be the Pat Symonds of Ferrari, Domenicali having too much at stake to be completely honest with the press and Montezemolo living in his own private dream world. Interestingly, something similar is happening at McLaren. As Ron Dennis begins to speak on a wider stage, Martin Whitmarsh is assuming the role of team spokesman and he seems to be bidding for a Symonds-like role too. While Big Ron doubts the stamina of BMW for the season (a conventional view that ignores the huge strides BMW have made in just two years), Martin is much more realistic in assessing the chances of each team in the developing struggle. The increasing visibility of Whitmarsh is, of course, a pointer towards Ron's eventual retirement from direct involvement in the team. This is most likely the last year in which Ron remains in control and we can expect to see much more of Martin in the coming months, as he becomes the face of McLaren. And already he is showing a commendable realism in his public statements. Expect to see a rather more user-friendly McLaren in the future. The big talking point since the Bahrain GP has been Hamilton's collision with Alonso - ITV commentators seizing on it as a chance to throw more stones at the Spaniard, others using it as an opportunity to get in a few kicks at the golden boy. As usual, the truth is much more mundane - Hamilton damaged his front wing early on and the upper section fell off just before the collision. We should be kicking ourselves for not having realized this from the first few replays. My excuse is that I was busy at the time and only reviewed the accident twice - but, even so, I noticed that Hamilton's upper front wing seemed to be invisible in the corners before contact was made. At the time, I assumed that it was just the camera angle that hid the element and, in retrospect, I feel a little foolish for not having looked closer. But, no matter, the incident is explained and there was no deep and dastardly plot involved. Surprise, surprise. Let us hope that the lesson has been learned and we will not be so eager to leap to unlikely conclusions in future. The big question remains, however: will McLaren get back on course and resume the battle with Ferrari (ignoring BMW for a moment)? Any answer must surely take into account Costa's caution; McLaren have bounced back in the past and they will do so again. Both championships are likely to be intense and bitter struggles this year and it will be a long time before a clear leader emerges. Which has to be good for the fans - and a great advert for the sport. Autosport has excelled today, as is evident from my choice of links up there. But I must mention Pitpass as well. The site has an excellent feature by Paul Stoddart that is characteristically frank and hard-hitting. Like him or loathe him, Stoddy is always ready to let you know what he really thinks! In regards to the Alonso/Hamilton incident, ITV only replayed it a couple of times, and not usually from the the front so it was very difficult to see that the wing was broken. I only noticed that when I saw the onboard shots from Lewis' car, on a link over at f1fanatic. So don't kick yourself too hard, Clive ! Imagine WMSC transcripts if Stoddy were in charge - they might have to bleep over the naughty bits! Forgive me if this is a stupid comment, but how does the fact that Hamilton's wing was broken explain why he hit Alonso? My fault, Simon - I should have explained more. The loss of a segment of the front wing would have decreased both downforce and drag, making the car a little quicker down the straights but more difficult through the corners. 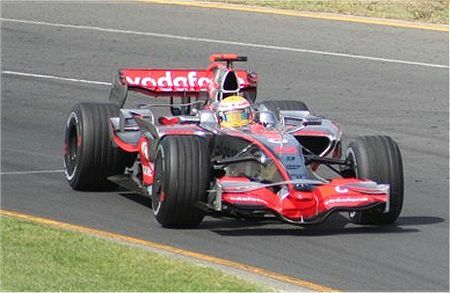 With the second breakage, when the remaining element of the wing fell off, Hamilton's car would have suddenly had less drag and acceleration would have increased quite dramatically. With only two seconds in which to react to the surge forward, it is understandable that Hamilton should have miscalculated his overtaking move and run into the back of Alonso's car. In fact, it must have happened so quickly that Hamilton did not understand what had happened - he put the collision down to a racing incident. It was only study of the telemetry and video that revealed that the wing had fallen off. In the first incident he lost his front wing at hitting in the back of… Alonso! Disaster was a perfect word to describe his race. At least he knows how to lose. No excuses, no sorrys, no accusations. In contrast, I´m still waiting for Massa and David to take his bit of guilty in their incidents this year. Something funny is that Lewis tried to create a two brand new ways of how to overtake in Formula 1. First he tried THROUGH Alonso and after OVER Alonso! The Lewis´start with onboard images is in the Formula 1 dot com. Thanks for the link, Becken. I've had a look round at some of the Spanish sites. The trouble is that they seem to be even more preoccupied with Max Mosley than the English ones (and no, they're not very impressed with him either). The one lengthy mention I saw was in the blog F1 al día (in Spanish), which jokes that Lewis thought that Fernando was slow round Turn 3 and "helped" him round the corner. Nice sense of humour. The commenters appear to find Hamilton's lack of judgement quite funny (and one says, wisely, that a picture tells more than a thousand words). Thanks for the links guys! It's ironic that, being spanish myself, I have always read english written blogs about formula1, but never spanish written ones. It's time to give my compatriots a chance. Thank you for the link, Becken.